Seeking four mysterious gates that could be the key to returning to their own world, your heroes dive into the dangerous asteroid colonies of the Shattered Zone. The polluted mines and hurtling planetoids are deadly on their own, but the infighting of the Zone's fractious factions is even more so, from the sadistic Contraptors to the fanatical soldiers of Purity, where factions and their adherents rise and fall and morality runs from gray to black. The PCs must navigate a broken world of deceit, moral compromise, and necessary sacrifices amid a grimy cybernetic dystopia, and all the while an ancient horror reaches from beyond the fourfold gates, waiting for those with the touch of destiny to come and set it free. There are secrets of the Patrons at stake, and the rewards are great, but only if the heroes can survive the deadly intrigues of the Confederates of the Shattered Zone. 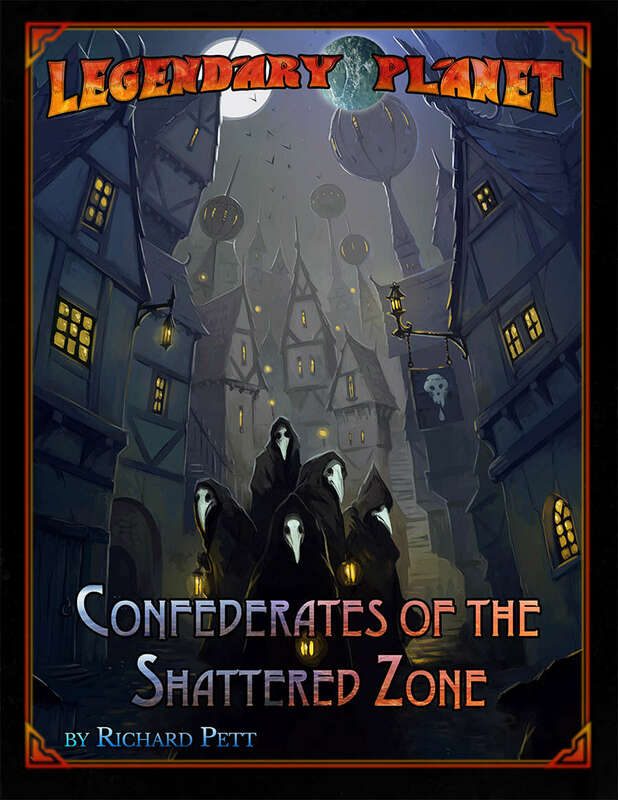 Confederates of the Shattered Zone is an adventure for 11th to 14th level characters using the Starfinder Roleplaying Game. The latest chapter in the amazing Legendary Planet Adventure Path, a spectacular sword-and-planet saga from Legendary Games blending sci-fi and fantasy, magic and machine with an exciting pulp sensibility and style. Confederates of the Shattered Zone includes not only a massive interplanetary adventure but also brand-new monsters, magic, and technology, including new character options for cybernetic augmentations, along with a full gazetteer of the Shattered Zone and its inhabitants and an ongoing fiction series. Here you will find amazing adventures that span the stars and plunder the planets in a campaign that takes your heroes to 20th level and beyond! Grab this exotic epic today and Make Your Game Legendary! - A "Planetary Bestiary" by Richard Pett and Mike Welham, featuring the the insidious ironrot lichen, the noxious steamwerks golem, the grotesque and savage feral kyton, the colossal choke ooze, the dour void grim, and the parasitical queborrin! - A collection of "Alien Treasures" by Richard Pett, including magic and technology like the darksphere, storm of chains, and void gondola! - A gazetteer of the deadly Shattered Zone asteroid field and its colonies, by Richard Pett. - A detailed look at the cybernetic auttaine race and the wide variety of technological and magical augmentations they have developed to enhance their biomechanical bodies by Patrick Renie.